So, it's been awhile. Lots of changes in my life, but loads of fun new projects as well. Rather than go into a lot of explanations and excuses I thought I would do a brief update to catch you up on what's been going on over here in the world of serious Spanish cuisine since I last wrote in February. To add a little cohesion to the whole mess, I will institute a scale from 1-10, 1 being tragic and 10 being euphoric. Calçot season came and went, as did a plate full of these seasonal delicacies lovingly grilled by my friend Jorge when I dumped the whole thing on the floor accidentally in a pile of broken ceramic (a 1 turned into a 6 when I was able to peel off the skins with the broken glass on them). I started a new company called Gustology (shameless self-promotion) and discovered that I am very talented at writing on food with a marker - not as talented as others (you know who you are) - but pretty darn good at it. I now carry a sharpie with me in my purse at all times because it's addictive. This young man was particularly forthcoming with his cucumber, unfortunately somewhat hard to read. Also in April, I started writing the new blog for Foods from Spain - which I am admittedly doing more regularly than my own. 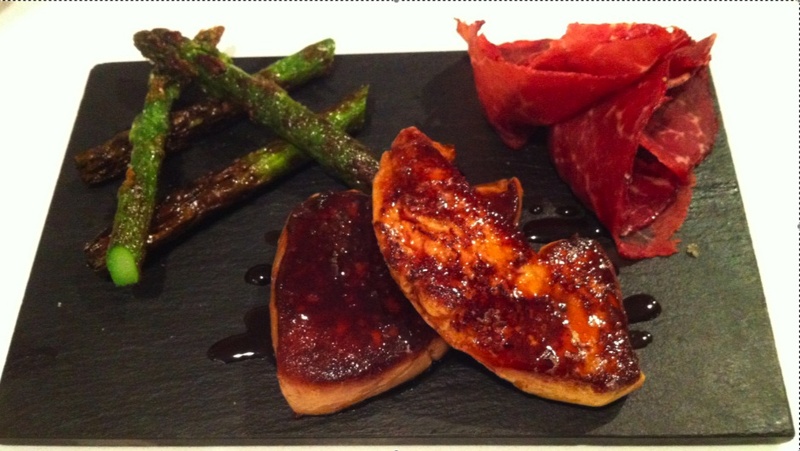 A lovely fresh foie with asparagus and bresaola. And maybe one of the most special things that I discovered over the past few months was this wine, Crápula (Based on a True Story) from D.O. Jumilla. Even so, you've gotta love it.